(Arab News)- London: The waters around it are deemed strategically vital for the GCC as they form part of the Red Sea and Bab Al-Mandeb Strait, one of the world’s busiest maritime routes — also used to transport oil from Middle Eastern producers. Recently elected President Muse Bihi Abdi acknowledged the strategic importance of Somaliland. “In today’s world we should be very strategic and cooperate with who is a friend of us and resist who is exploiting us, therefore we should make use of our strategic location in the world,” President Bihi told Arab News. His comments came as a Saudi-led military coalition thwarted an attack on a Saudi oil tanker by Houthi rebels near the Yemeni coast on Tuesday. 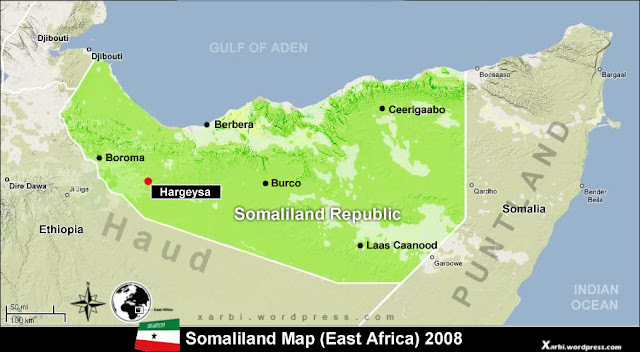 In the Gulf, President Bihi said, Somaliland is very close to Saudi Arabia and the UAE for a number of reasons. The UAE, President Bihi said, is a key economic ally. “All our imports depend on the UAE and their ports, all our flights come through the UAE. It is our bridge to the world,” he said. In an interview with Arab News, analyst at the Arab Gulf States Institute in Washington, Taimur Khan, said that ridding the Horn of Africa of extremists was vital for the economic and military security of GCC states. He added that the Yemen intervention had also heightened interest in the coastal territory along the Horn of Africa “to seccure military basing agreements,” said Khan. Earlier this year a row broke out when UAE was banned from operating in Somalia after Dubai’s DP World reinforced its commitment to build a port at in Berbera, Somaliland. Somalia does not recognize breakaway Somaliland which, in turn, refuses to take instructions from Mogadishu. Separately, Djibouti terminated a contract that allowed DP World to operate the Doraleh container terminal on its east coast. That made building up Berbera even more important for UAE. According to ambassador Bashe Omar, Somaliland’s UAE representative, in 2016 the international affairs deputy of Iran’s Chamber of Commerce, Industries, Mines and Agriculture, Mohammad Reza Karbasi visited the country. The Iranian delegation was looking at buying land to establish a logistical hub,” he said. The Iranian delegation wanted to develop a logistical hub and use the strategic sea port for trade. Omar said that the government had refused the proposed plan. He added that in 2015 Turkey also sought to invest in Hargeisa International Airport. “This was also refused because of the Turkish links with Mogadishu as well as the government support for Somalia in opposition of Somaliland,” said President Bihi. But other powers such as Turkey and Iran are also seeking influence in the Horn, viewed as a gateway to fast-growing African markets. The UAE and Turkey both have offered packages to Horn countries that include not only ports and connectivity infrastructure, but security training and aid, education and job creation, that set them apart, said Khan. In 2017 the Somaliland government approved a 30-year concession for UAE ports operator DP World, along with a military base near Berbera, for the UAE armed forces. President Bihi said that the base is a requirement to secure the expansion of the port. Berbera port has been developed since operations in 2017 began to receive 150,000 containers. According to Ali Ismail Mahamoud, head of operations at DP World Berbera Port, an 800-meter greenfield container terminal expansion will be completed by 2020 allowing the port to compete with regional players in terms of capacity.